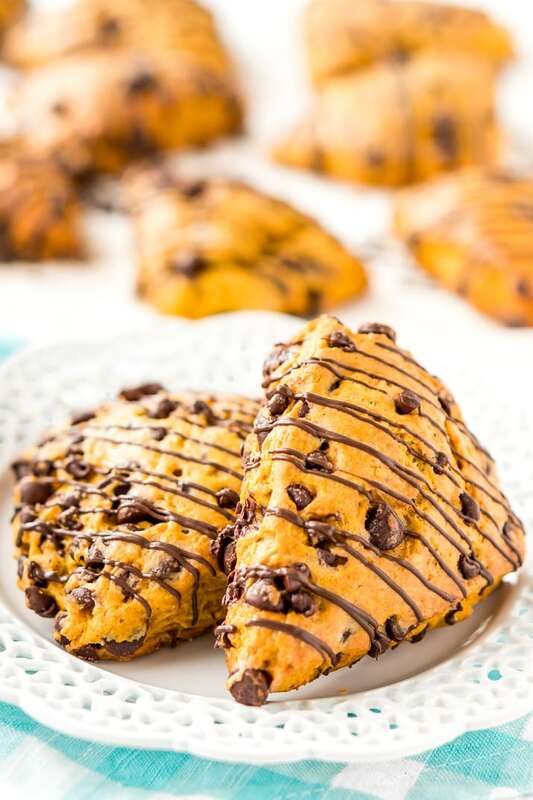 Pumpkin Scones are the sophisticated way to enjoy pumpkin and spice this season! This simple recipe calls for dark and semi-sweet chocolate chips so you can indulge your chocolate cravings and get your pumpkin fix morning, noon, or night. It’s pumpkin season, guys! 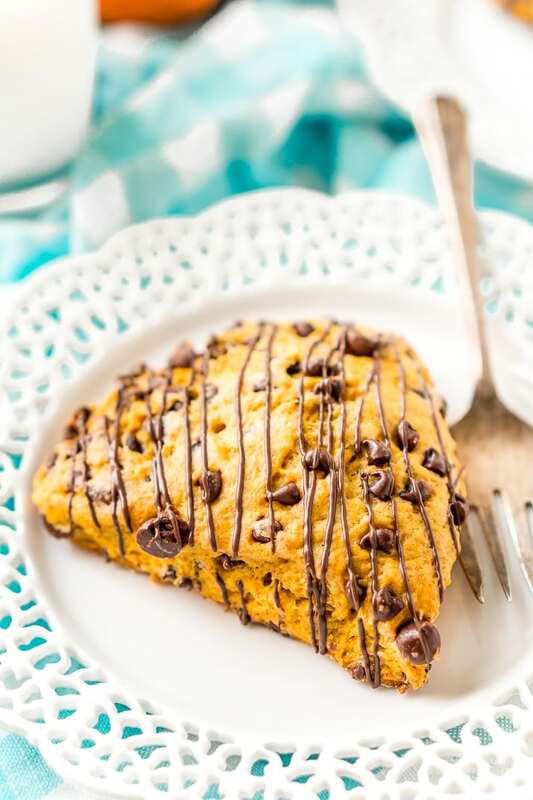 You may be craving Pumpkin Bread or Pumpkin Cookies, but make sure you also bake a batch of these chocolate-studded Pumpkin Scones, the most sophisticated way to get your fill of fall flavors! 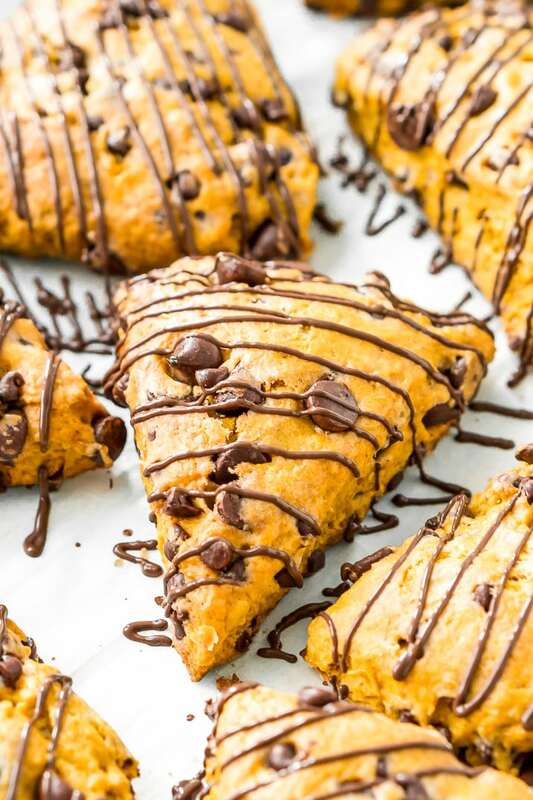 Morning, noon or night, Pumpkin Scones are a tasty snack that you can enjoy with coffee, tea, or a glass of milk! JUST TAKE ME TO THE PUMPKIN SCONES RECIPE ALREADY! 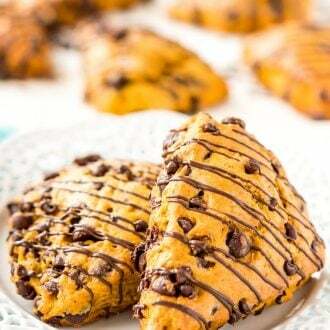 If you’d rather skip my (very helpful, I think) tips and tricks, essential cooking info, and similar recipe ideas – and get straight to this deliciously easy Best Ever PUMPKIN SCONES Recipe – simply scroll to the bottom of the page where you can find the printable recipe card. They’re made with simple ingredients like flour, sugar, eggs, and pumpkin puree, and of course, they call for a generous dose of warm and fragrant Pumpkin Pie Spice. Fans of Starbucks Pumpkin Scones will love this homemade version, which tastes better than the ones you usually order with your Venti Latte. Plus, when you make them yourself, they’re fresher, more natural, and definitely cheaper than buying them every day! Begin by lining a large baking sheet with parchment and setting it aside. Next, In a large mixing bowl, whisk together the flour, sugar, baking powder, salt, and spices. Work in the cold butter with a pastry cutter just until the mixture is crumbly. Then, in a separate, small mixing bowl, whisk together the pumpkin and eggs until smooth. 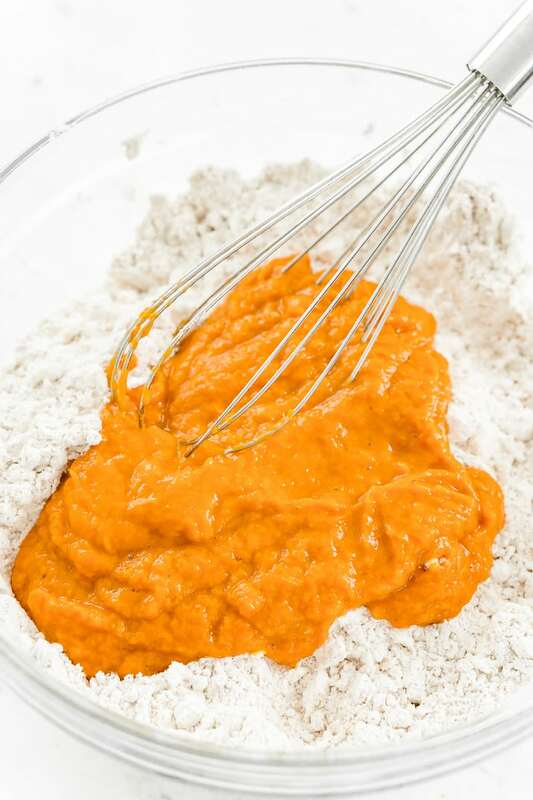 Add the pumpkin mixture to the dry ingredients and mix until well combined. My Favorite Pastry Cutter!Buy Now! 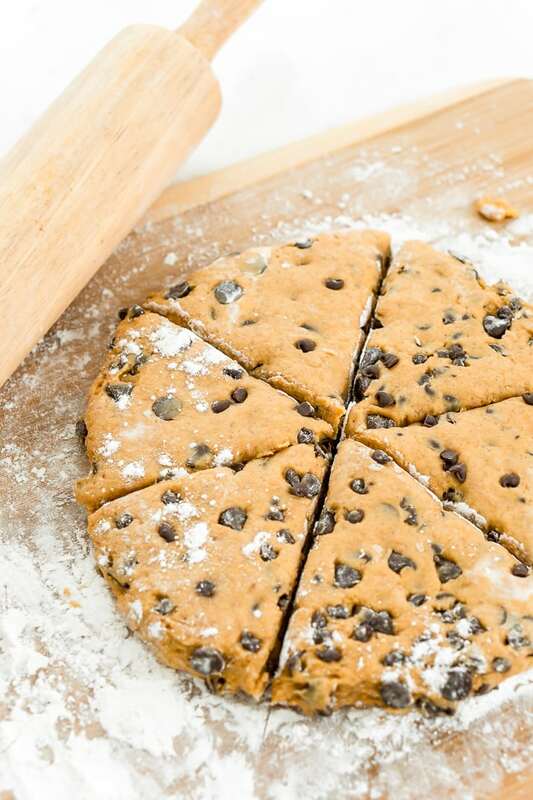 If you want them, and why wouldn’t you, fold in the chocolate chips. Then sprinkle and spread some flour onto a clean surface and scrape the dough out of the bowl onto it and divide the dough in half. Round each half into a ball and use a floured rolling pin to flatten the dough into circles that are about 3/4-inch thick. Shape the edges with your hands if needed. Next, use a large knife or pizza cutter that you’ve run under cold water and slice each circle into 6 wedges. My Favorite Pizza Cutter!Buy Now! Carefully transfer the wedges to the prepared baking dish, leaving 1 to 2 inches between each wedge and brush each wedge with milk. Finally, bake the scones for 22 to 25 minutes, or until they’re golden brown and a toothpick inserted into the center of one comes out clean, with no wet crumbs. Remove the scones from the oven, and serve warm. Feel free to drizzle with additional melted chocolate. Wrap any leftovers airtight, and store at room temperature. Reheat very briefly in the microwave, if desired. To Freeze Scones: Wrap scones individually in plastic wrap and then place in a large freezer bag, remove excess air. Store in the freezer for up to 3 months, transfer to the counter to thaw at room temperature. I make pumpkin recipes of all kinds, but there are two reasons that Pumpkin Scones really hit the spot when a certain mood strikes. For one, they’re just sweet enough to enjoy as a pick-me-up without being too much; and second, they’re filled with decadent dark and semi-sweet chips for when chocolate cravings hit! Ever wonder what makes scones different from other baked goods? The dough is pressed in a circle, then cut into wedges in order to make those traditional scone shapes. Then, each piece is brushed with milk and sprinkled with cinnamon and sugar, forming a sweet crust on top. I’ll let you in on another secret: to help each piece rise, put them in the freezer for a half hour to chill just before baking. It’ll make the texture of your scones better than ever! 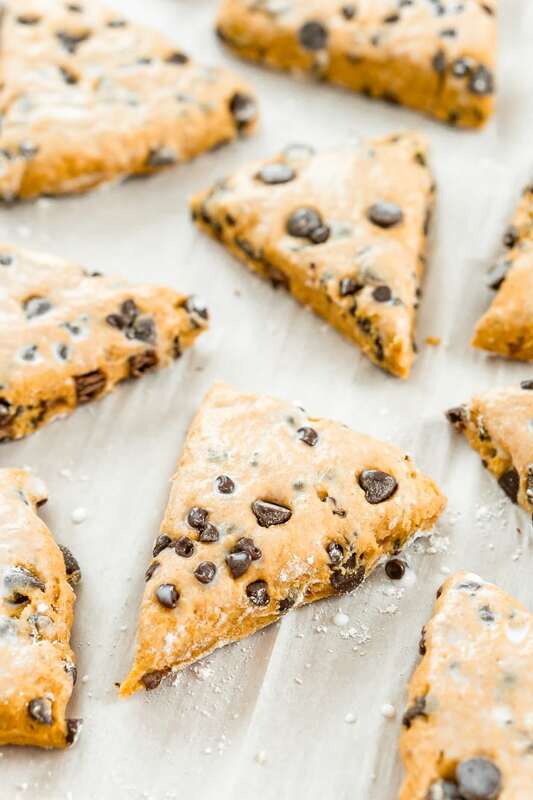 Not only is this Pumpkin Scone Recipe easy to make, these treats are perfect finger foods to serve at brunches, luncheons, or to bring to any event or fall gathering. Everyone will think you’re fancy for bringing scones, but really, they’re no harder to make than a batch of cookies! Serve these alongside my whipped Homemade Cinnamon Butter, and everyone will be going back for seconds or thirds! 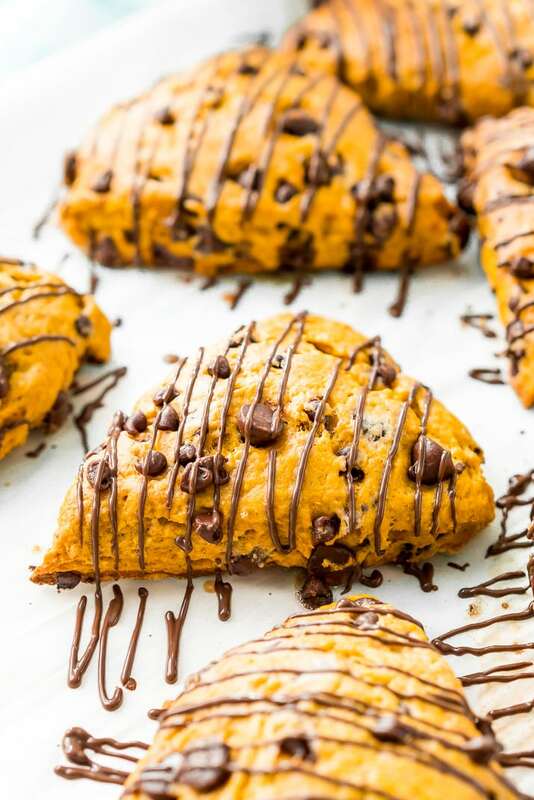 Pumpkin Scones are the perfect way to enjoy some of autumn’s best flavors in a few bites. Make a batch, and enjoy them for breakfast, dessert, an afternoon snack, or any time you get a hankering for that spicy pumpkin goodness! 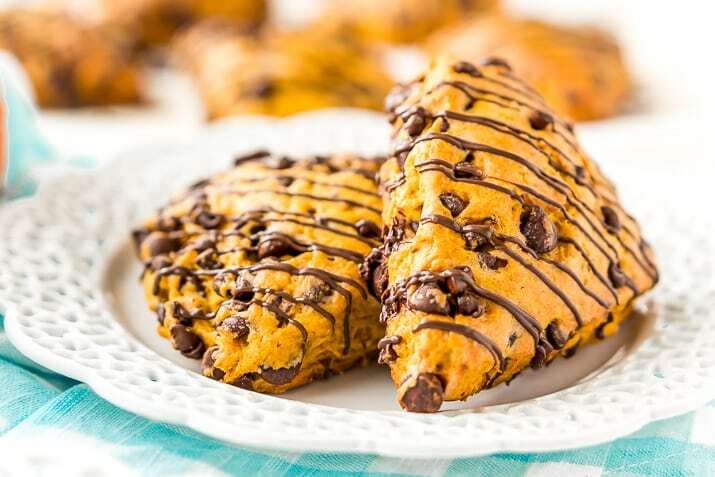 Pin this Pumpkin Scones Recipe for Later! Work in the cold butter with a pastry cutter just until the mixture is crumbly. In a separate, small mixing bowl, whisk together the pumpkin and eggs until smooth. Add the pumpkin mixture to the dry ingredients and mix until well combined. 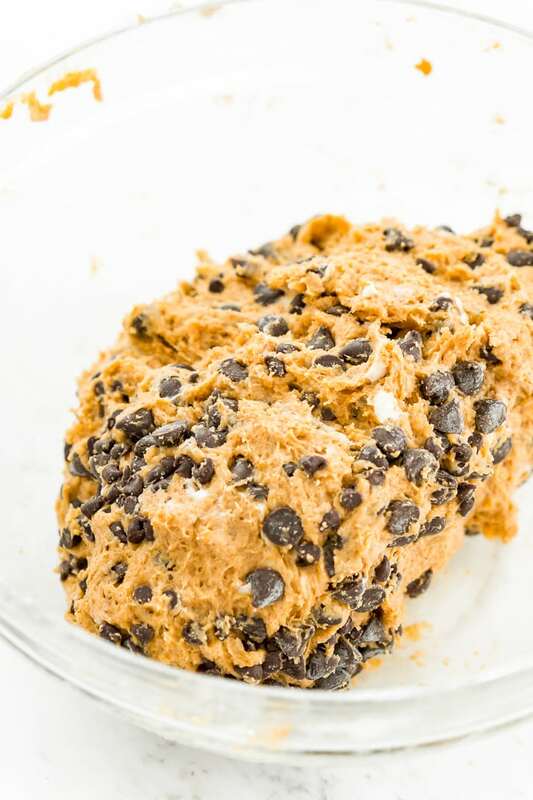 Fold in the chocolate chips if you want them. Sprinkle and spread flour onto a clean surface and scrape the dough out of the bowl onto it and divide the dough in half. Use a large knife or pizza cutter that you've run under cold water and slice each circle into 6 wedges. Carefully transfer the wedges to the prepared baking dish, leaving 1 to 2 inches between each wedge, and brush each wedge with milk. Bake the scones for 22 to 25 minutes, or until they're golden brown and a toothpick inserted into the center of one comes out clean, with no wet crumbs. OMG, this is sooo yummm!! You have combined two of my favorite ingredients: Pumpkin + chocolate 🙂 I’ll be trying these soon. These look like I’m back in Paris! So Yummy! !